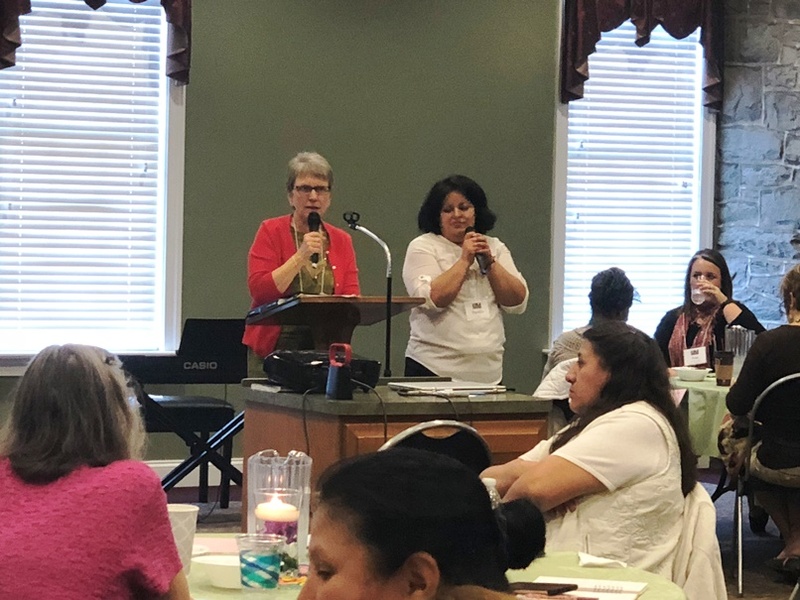 On April 14 approximately 80 women from across Franconia and Eastern District Conferences joined together at Towamencin Mennonite Church for the annual Sister Care Gathering. The theme was “Darkness Unfolding as Light,” with the book of Ruth as the Biblical text. Cathy Spory, Elementary Principal at Johnstown Christian School, took on the character of Naomi and gave insightful first- person monologues. Marilyn Bender, one of four co-pastors at Ripple Church in Allentown and Rose Bender Cook, Marilyn’s sister-in-law and a bi-vocational pastor at Whitehall Mennonite Church, shared their personal and Biblical reflections including speaking of the illness and loss of Marilyn’s husband John, Rose’s brother. The women were invited to string beads, with knots representing the rough places and the iridescent beads representing those light-filled moments. There was time for conversation and prayer with each other at our tables, and an opportunity to experiment with different ways to pray including praying with color, walking prayer, healing prayer and anointing. 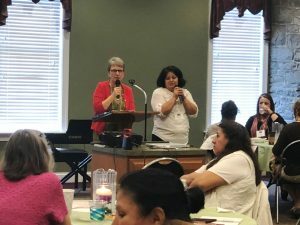 Pastor Letty Cortes from Centro de Alabanza led the women in activities to get to know one another. 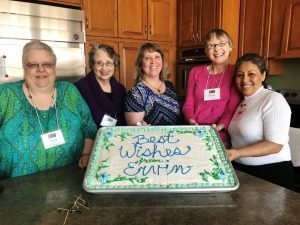 There was much singing together and the women enjoyed a delicious lunch including a wonderful cake gifted to them from MCUSA out-going Executive Director, Ervin Stutzman, from his retirement party the night before. It was bi-lingual day, with everything presented in English and Spanish, and was a deeply moving day, culminating in the women giving testimony as to where God had unfolded their darkness into light. Many thanks to the planning committee: Anne M. Yoder, Coordinator; Pastor Donna Merow; Pastor Doris Diener; Pastor Letty Castro; and Pastor Marta Castillo. 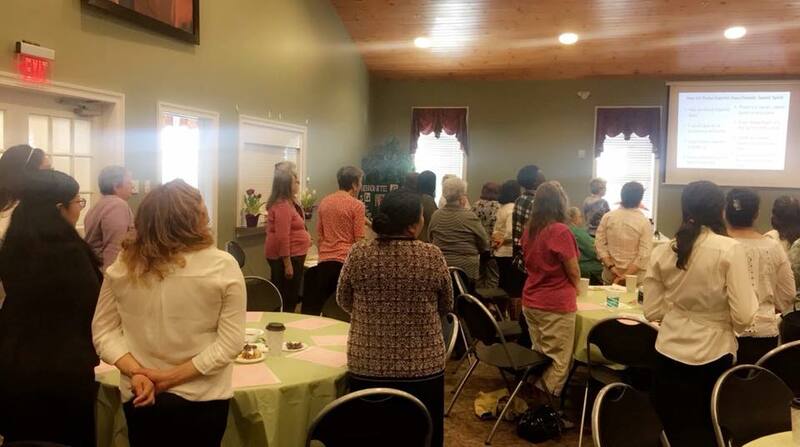 Special thanks to Pastor Marilyn Bender, Pastor Rose Bender Cook and Cathy Spory for all their energy and all they shared with the women of our Conferences. On Sunday, October 9, John Bender, former conference minister with Franconia Conference, beloved brother in Christ, and congregant of Ripple went to meet the Lord after a fierce battle with cancer. John served the church with grace, hope, and compassion. His ministry will be remembered for a conscientious care for the cities, neighborhoods, congregations and people where he served and led in the way of Jesus. We were privileged to have John’s last year’s of earthly ministry to be among us in Franconia Conference. We mourn his untimely death with his family while celebrating his life as one who sought to live justly, to extend mercy and to walk humbly with our God. During the last staff meeting in this space in between, I invited my colleagues to share their celebrations and questions for the last month. Without exception, the celebrations and questions had to do with pastors. We celebrate the completion of pastoral search processes, with the beginning of Mike Spinelli’s leadership at Perkiomenville; the call of Maria Hosler Byler to an associate pastor role at Salford; Josh Jefferson’s installation and licensing last Sunday at Souderton as a youth pastor; and Sandy Drescher-Lehman’s beginning as pastor at Methacton. Many of these processes were lengthy discernments. We celebrate the new beginnings and new possibilities that leadership can bring in the life of our communities. Conference staff took a road trip with Pastor Bruce Eglinton-Woods (Salem), to explore the community where the congregation is ministering. Our questions had to do with how we walk with pastors and congregations through difficult times. We wonder how God will provide with prolonged pastoral search processes at Franconia and Taftsville. We prayed as John Bender from Allentown who was in the hospital making difficult decisions between life and death, as he was readmitted to the University of Pennsylvania Hospital in Philadelphia (he made the decision by the time our meeting had ended). We prayed for an upcoming surgery that Charlie Ness from Perkiomenville will be undergoing. These are all things we attend to as staff beyond our meeting time and carry in our hearts and heads. The last month has meant focused attention on planning for Conference Assembly — a great time to celebrate the work God is doing in our midst, and spend time discerning and equipping ourselves for the future. Registration and the docket are available at http://edc-fmc.org/assembly/ to help us, as a conference, prepare for assembly at Penn View Christian School. Postcard invitations and posters will be coming to your congregations in the next two weeks. We’ve hosted and gotten some feedback from our time with David Boshart (moderator-elect) from Mennonite Church USA. We’re prepping for his return at assembly to discuss more specific issues around human sexuality that continue to challenge our capacity to be church together, while going to the margins to be and proclaim the Good News. Our conference executive minister Ertell M. Whigham comes back on the job on Saturday, October 1. My season of this stretch of the race as acting executive minister has passed. I’m ready to return the baton and responsibilities back to Ertell as he navigates the next few months. I’ve learned a lot in these months. I’ve been busier than usual with meetings, emails, texts and phone calls. I have lots of hope for us as a community, but recognize our fragility at the same time. God continues to bless us with flourishing, and challenges enough to test and grow our hearts, minds, and souls. At the beginning of these three months, I felt drawn to the text to “live a life worthy of my calling.” This time, ending this stretch, I want to turn that text back over to us as individuals and a community, to stay focused on the things we’ve discerned together, and to live, work and minister together in such a way that honors the sense of call that exemplifies what God has invited us toward in extending the peace of Christ to each other and to neighbors nearby and faraway. Last year, Mennonite Church USA surveyed credentialed leaders on a variety of issues and questions, covering demographics, conferences, the denomination, and the currently difficult issue of attitudes toward homosexuality and the status in the church of individuals who identify as lesbian, gay, bisexual, transgender, or queer (LGBTQ). The research, led by Last year, Mennonite Church USA surveyed credentialed leaders on a variety of issues and questions … Conrad Kanagy of Elizabethtown College, offered a glimpse into the perspectives of leaders from coast to coast. Franconia Conference contracted with Kanagy to provide additional analysis of his material for our conference community. On Saturday, March 14, Kanagy delved more deeply into the data with about three dozen conference pastors at Covenant Community Fellowship in Lansdale. 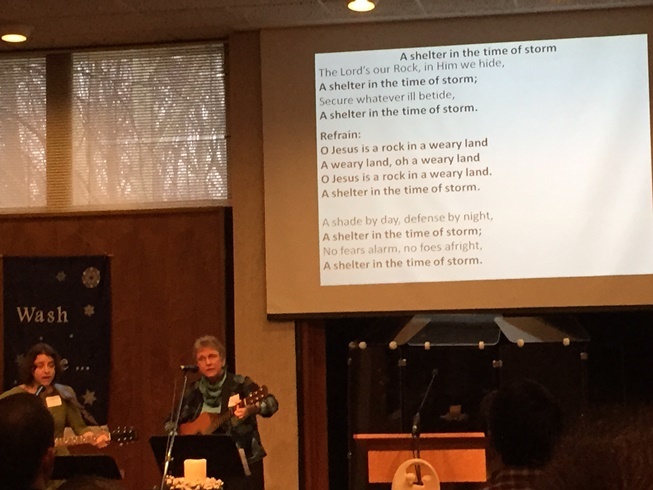 The morning’s work began with prayerful worship, with music led by Marilyn Bender (of Ripple Allentown) and Samantha Lioi (Whitehall congregation). 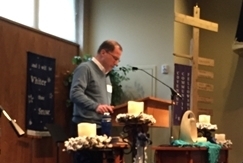 John Bender, interim associate pastor at Franconia Mennonite Church, led a guiding reflection. He referred to Romans 14:3, where followers of Jesus are advised not to pass judgment on the servant of another: “Those who eat must not despise those who abstain, and those who abstain must not pass judgment on those who eat; for God has welcomed them.” Bender asked leaders to consider what might result from a daily prayer for oneness, and a concerted effort to see each person as a sister or brother in Christ. To begin his presentation, Conrad Kanagy invited leaders to consider the wisdom of Paul in Colossians 3:1-15, highlighting Paul’s emphasis on magnanimity, charity, and generosity in relationship with one another. These spiritual values were lifted up throughout the presentation. “This morning is about understanding what has shaped our differences, the implications of those differences, and where we can go in the future,” said Kanagy. With frankness, he said he was “not even suggesting we can keep living together,” but asserting that we can be kind and gracious. Leaders recognized this conversation as a beginning, an opening. Even while thanking Kanagy for his time and effort on data analysis, several leaders suggested it might be helpful to invite additional interpretations of the data. Conference board member Jim Laverty expressed gratitude for Kanagy’s honesty about the cultural differences that separate us. “He helped me to better appreciate the different worldviews represented in the survey results so that I might better appreciate just how profound these cultural differences are. I felt, overall, that the meeting drew together credentialed leaders from across the spectrum of worldviews and that as we met around round tables that we genuinely desired to listen and understand each other. I was grateful that at my table I could express my concern about how these differences will impact local congregations and how we choose to use or not use our power and influence as leaders to sway the opinion of others,” said Laverty. What comes to mind when you imagine Franconia Conference LEADership ministers and the work they do? You may be surprised to know that the new conference office at Christopher Dock Mennonite High School is probably not the place to find them, although a phone call there will certainly get you connected. Steve Kriss, Jenifer Eriksen Morales, Aldo Siahaan, John Bender, Noel Santiago, and Ertell Whigham are always on the go. 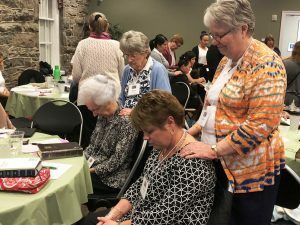 Each one connects with anywhere from three to 12 congregations in Vermont, northern Pennsylvania, the Lehigh Valley, southeastern Pennsylvania, and Georgia. They give much time and energy to congregations in transition and emerging congregations. An estimated 50 percent of conference congregations are in the midst of transition and/or growth. Pastoral leadership is a common transition. Some congregations choose to work with an intentional interim pastor who stands in the gap and prepares the congregation to receive a new pastor. The LEAD ministers provide guidance for both search processes, and support elders and lay leaders in managing the congregation’s current and future priorities. 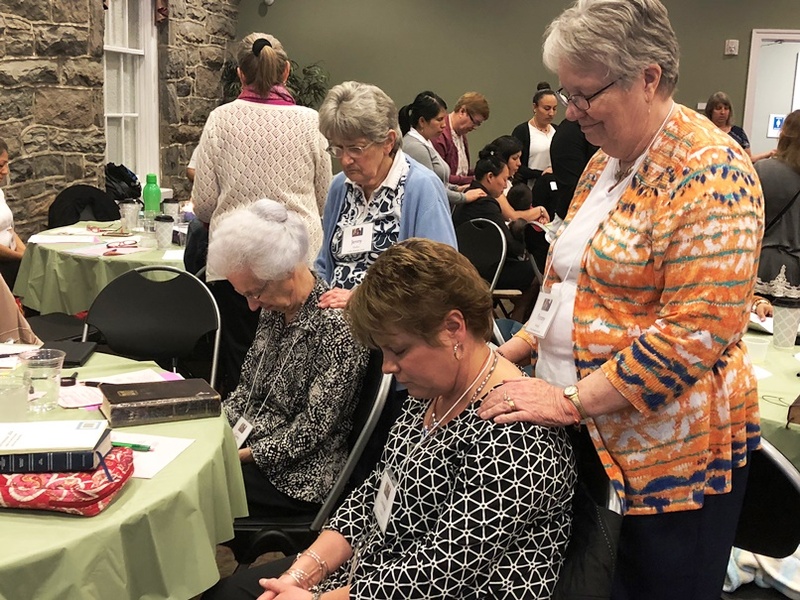 Jenifer Eriksen Morales, minister of transitional ministries, also works with other Mennonite Church USA (MCUSA) conferences on the east coast to train intentional interim pastors, and serves on the MCUSA task force for interim pastoral ministries. Emerging and growing congregations are another focus. These congregations are high maintenance, but in a very good way. 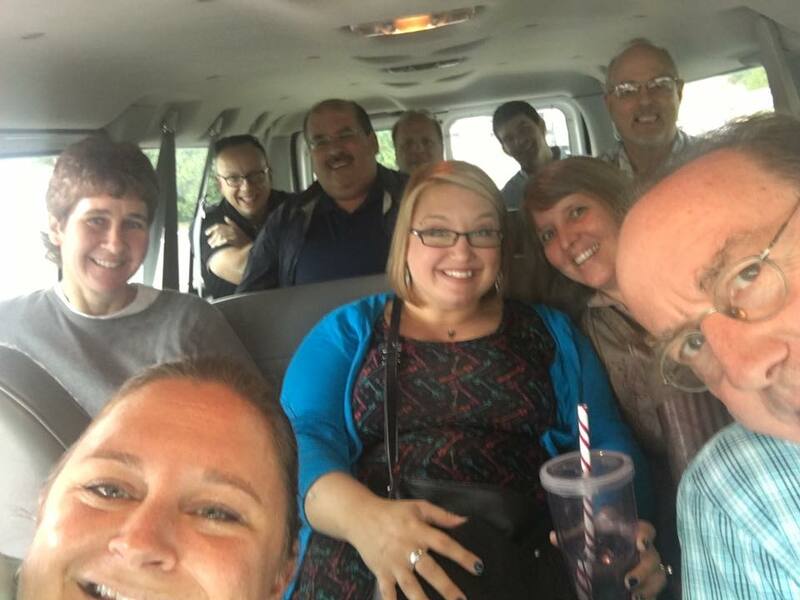 LEAD ministers help to address staffing needs, work with pastors who are new to the Anabaptist faith, and build relationships—in essence, anything that propels the missional vision forward. The work of the LEAD ministers sometimes crisscrosses when their congregations work together. The Lehigh Valley youth ministry partnership is shared by the Whitehall, Ripple and Vietnamese Gospel congregations and led by Danilo Sanchez. 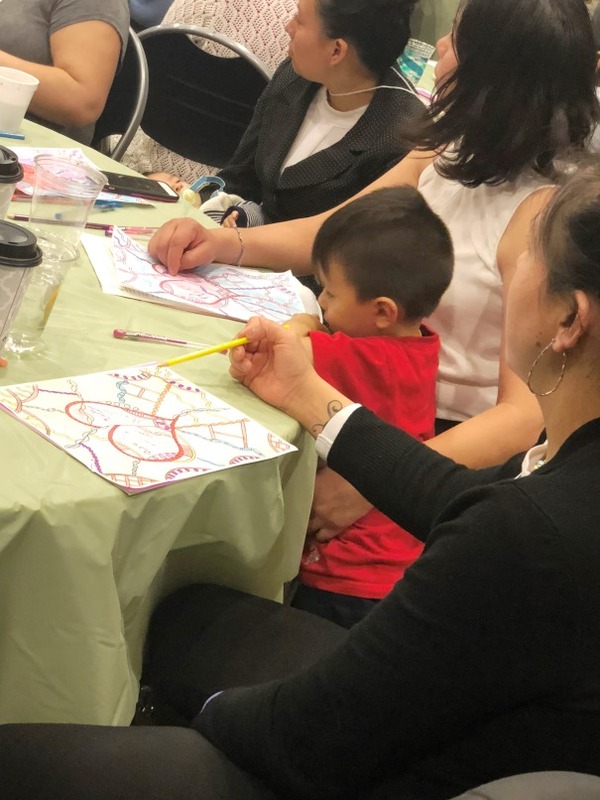 Vietnamese Gospel Church in Allentown and Philadelphia Praise Center are partnering in a joint worship and outreach ministry with the Vietnamese community in south Philly. The LEAD ministers must also nurture their relationships with each other so their collaborations are fluid and fruitful. Last summer, Aldo Siahaan and Steve Kriss received a “Macedonia call” (Acts 16:9-10). Could they meet with a Mara (Burmese) church during their visit with Georgia Praise Center leaders? This congregation in Atlanta is part of a network of Mara churches in Indianapolis, Indiana, Baltimore, Maryland, and Charlotte, North Carolina. The network is reaching out to Mennonite conferences on the east coast for assistance in establishing pastoral leadership. The exploratory relationship has many possibilities. Each LEAD minister offers her or his unique gifts to their congregations. Noel enjoys helping pastors, elders and lay leaders experience the values and practices of intercessory prayer. Jenifer weaves in a missional focus with unchurched neighbors, adapted from the Kairos in Chaos ministry she’s involved with in Souderton. Aldo enjoys a natural affinity with the Mara church through their similar languages of Indonesian and Malay. Steve and Ertell always bring best practices of intercultural competencies to the mix. Looking for your congregation’s LEAD minister? She or he may be in a meeting, consulting with pastors or elders in a coffee shop, or in a car on the way to your church. Sharon K. Williams is a musician, editor and congregational/non-profit consultant. She serves the Lord with the Nueva Vida Norristown New Life congregation as the minister of worship. 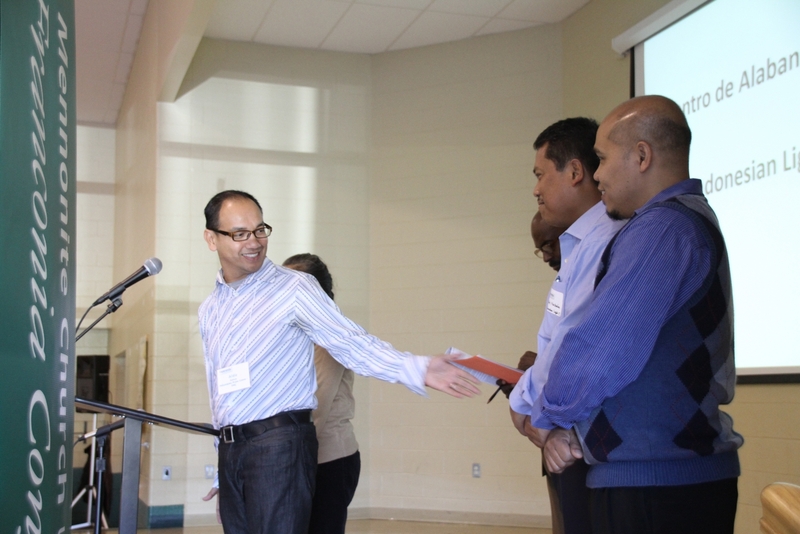 Experienced Mennonite pastors John Bender and Aldo Siahaan have joined the Franconia Conference team of LEADership Ministers, bringing experience in church planting, intercultural leadership, and congregational pastoral work. Each will serve alongside several congregations yet to be decided and will work from home bases in southeastern Pennsylvania’s largest cities while continuing pastoral ministry assignments. 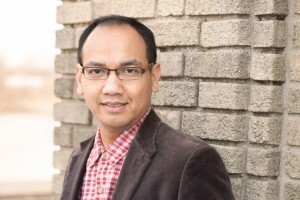 Aldo Siahaan, based in Philadelphia, helped start Philadelphia Praise Center in 2005. The congregation joined Franconia Conference in 2006, and Siahaan became credentialed as lead pastor in 2007. Siahaan’s other ministry experience includes being a board member of Mennonite Central Committee East Coast, teaching a summer cross-cultural course at Messiah College, and being a member of the Indonesian Pastoral Network. John Bender, based in Allentown, Pa., is a graduate of Eastern Mennonite University and Eastern Mennonite Seminary. He and his wife, Marilyn Handrich Bender, started Raleigh (N.C.) Mennonite Church, where they co-pastored for 18 years. For the past nine years, John pastored Pittsburgh Mennonite Church. In July 2013 the Benders moved to Allentown, Pa., where John is the part-time director of Ripple Community, Inc., a ministry of the RIPPLE congregation. He is also interim associate pastor of the Franconia congregation. 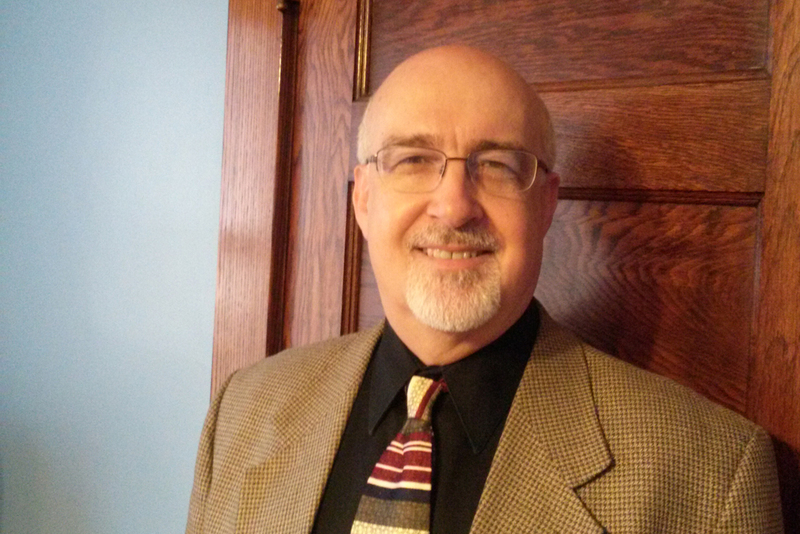 Bender served in a number of leadership capacities with Virginia Mennonite Conference and Allegheny Mennonite Conference and has close to 30 years of pastoral ministry experience. “I care deeply about pastors and churches and helping them to pursue healthy relationships together, and I hope I can be a resource to pastors and a guide along the way,” Bender said. LEAD is the conference’s platform for oversight, designed to Lead, Equip, And Disciple both lay and credentialed leadership as they guide congregations. A congregation’s LEAD team is comprised of a LEADership minister, the pastor, the chair of the congregation’s governing body (when relevant), and a LEAD advisor from beyond the congregation. 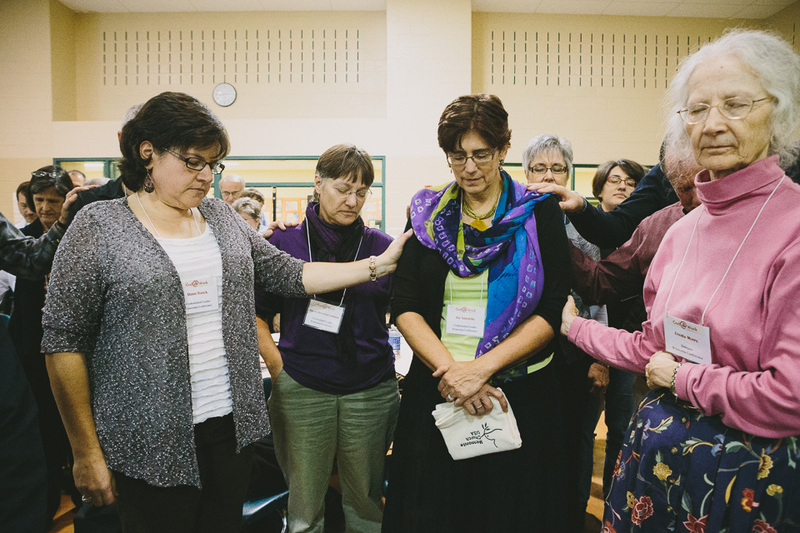 LEADership ministers serve as the primary point of contact between congregations and Franconia Conference. 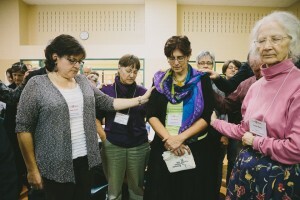 Joy Sawatzky, pictured here receiving prayers of blessing at Conference Assembly 2012, was approved for ordination at the November 3rd ministerial meeting. Photo by Andrew Huth. The ministerial committee met on November 3rd. Chris Nickels was welcomed as a new member. Marlene Derstine was thanked for her completed time of service. Sandy Landes was approved for a license toward ordination at Doylestown congregation as Pastor of Prayer and Pastoral Care. Joy Sawatzky was approved for ordination as Pastor/Chaplain at the Souderton Mennonite Homes. Joy is a member of Plains. John Bender’s ministerial credentials were received from Allegheny Conference for ministerial leadership at Ripple and Franconia congregations. The ministerial credentials of Emily Ralph and Robert Nolt were approved to be transferred to Lancaster Conference. The license toward ordination for Julie Prey, Joe Hackman, and Scott Franciscus were renewed for another two years. Duane Hershberger’s ministerial status was changed from active to retired. Donna Wilkins’ license for specific ministry was terminated with the end of her responsibilities at Blooming Glen. Mike Ford, formerly youth pastor of Franconia congregation, has transferred to Blooming Glen, working in youth ministries. Walt Morton is serving as an interim pastor at Lakeview.